Hello 2017! We barely made it. What, it’s been a few days already? Shhhh. AniTAY’s never really done a “Best of ___” as far as I know, mostly sticking to individual lists from our varied group of authors. I debated making one for myself, but thought it would be more fun to get as many author’s opinions that I could and then compile them! Note, that this is different to the AniTAY Awards that our friend Rockmandash12 is doing (Space Whale Forever!). I asked individual authors for their Top 5 anime of 2016 in no order and then counted how often individual shows showed up. I asked through Discord so I apologize if I missed you. In the end I got about 25 different lists with a total of 49 different shows that appeared! Shorts, OVA’s, Movies, anything that finished airing in 2016. Into the jumbled mess they all went, and what emerged seemed to be a pretty good ranking of all the shows we watched this year, even if there may be minor quibbles here and there. Also ShadowHaken gave me a Top 5, but not a single one of his shows were in anyone else’s Top 5. HipsterHaken indeed. Our contributors were myself Gugsy, Kinksy, DilKokoro, Nomadic Dec, Memento Morie, Raitzeno, Stanlick, Ryoma Nagare, Requiem, Tenshigami, Rockmandash12, Maelwys, Dexomega, Exile, Protonstorm, Grex, Koda Kazar, Jonuiuc, Krakken Unleashed, Ishamael, The Messiah, Nanttene, Shade, ThatsmaPizza and Stinolez. Thank you all again. Alderamin on the Sky, Amanchu, Arslan Senki Season 2, Bakuon, Big Order (lol), GATE Season 2, The Great Passage (Amazon c’mon), Lupin III Part 4, Macross Delta, Magi: Adventure of Sinbad, Orange, Osomatsu-kun (;-;), Myriad Colors Phantom World, Planetarian, Sailor Moon Crystal Season 2, Sakamoto, Schwarzesmarken, She & Her Cat, and last but not least Tabi Machi Late Show. And a one for Hipsterhaken’s magical Top 5 of Luck & Logic, Rainbow Days, Cardfight! Vanguard: Stride Gate, Tiger Mask W and Nobunaga no Shinobi. Pour one out for these 24 shows, and let’s get to the contenders! Four sequels get repeat mentions (Concrete Revolutio is absolutely robbed but you’d expect nothing less from me). Luluco is the highest rated short of the year for us as Trigger’s love letter to itself. A couple family comedies in Poco and S&L, a dark comedy in Girlish Number and what was one of the most anticipated shows of the whole year week to week in Erased. You all got two votes so congratulations! The movie that’s currently blowing up across the world! A few of our authors got to see it in Anime Expo over the summer, but by and large it hasn’t been released in many areas outside of Asia, so many of us haven’t seen it, including myself. All in all, probably the right place to be in these rankings. Three votes for you! With 4 votes from our authors, things are getting a lot more competitive here. One of the better mafia anime to have aired, one of the best sports anime, and one of the best shounen battle anime in recent time. 91 Days had compelling drama, twists and turns and gripping tension across its run. Likewise Haikyuu gave us a season of training and also one of the most exciting final games of all time. My Hero Academia gave us a true underdog story with grit and perseverance, giant battles and even more never-say-never attitude. All barely missed our Overall Top 10. So sad. Moving along! OH MY GAWD. AniTAY is one of the most pro-Jojo’s out there and yet Josuke Higashikata can reach no higher in these esteemed rankings. Its art and animation remained fabulous, and it gave us one of the best villains of the year. One of the more uniquely released series this year, ReLIFE was dropped all in one day as opposed to weekly and still garnered enough praise to not be forgotten. A fantastic rom-com in a year that didn’t have many, now if we could only have more of it. Finally, our favorite ice-skating duo gets a nod here. Mixing elements of sports and a mature gay romance together in a unique blend that ended up entrancing the anime community. One of the most widely praised anime and certainly the most popular anime of the year, unfortunately for our authors was one of the most controversial ones internally. Some people loved it clearly, others disliked it very much. Whether you’re a Rem fan, or Emilia or Ram or Crusch or Felt or maybe even a Betelguese fan, you heard about Re:Zero this year, its drama and the suffering it put our main character Natsuki Subaru through. Nonetheless, Re:Zero earned its place on six different Top 5 lists so here it is. Winter’s highest rated magical girl show (of which there were plenty) ends up in the AniTAY Top 5 ... well 6 because ties but forget that. Flip Flappers had probably the most imaginative settings of the year, and a story that was certainly unique. Meanwhile, summer’s most relaxing slice of life about our titular aerial witch in the countryside received 7 votes from our authors. Relaxing at its finest, these two had magic in the profound and also in the mundane. Both highly recommended to be sure. Now we’re talking! Coming from the mind who made last year’s smash hit, One Punch Man, Mob arguably took some of those ideas and improved upon them. I’ll admit this was a close contender for my personal Top 5 but did not make it. Incredibly animated and fights that were the best of the year, Mob was always a spectacle to watch in the best of ways. Meanwhile, our second favorite comedy of the year in Tanaka. It took an episode for our cast to really gel and riff on each other but it became one of the most beloved anime for our authors. The easiest show on this list to just relax and binge through on a rainy day. Unfortunately only 8 votes for these two shows so tied for 3rd they remain. And now! Studio Deen sweeps the first place for our authors! Both coming in Winter 2016, they remained our critical darlings throughout the whole year. And with both returning for sequels in Winter 2017, you can expect us to be waiting on bated breath from more of these outstanding shows. Vastly different in almost every way, they are our Top Shows of 2016. 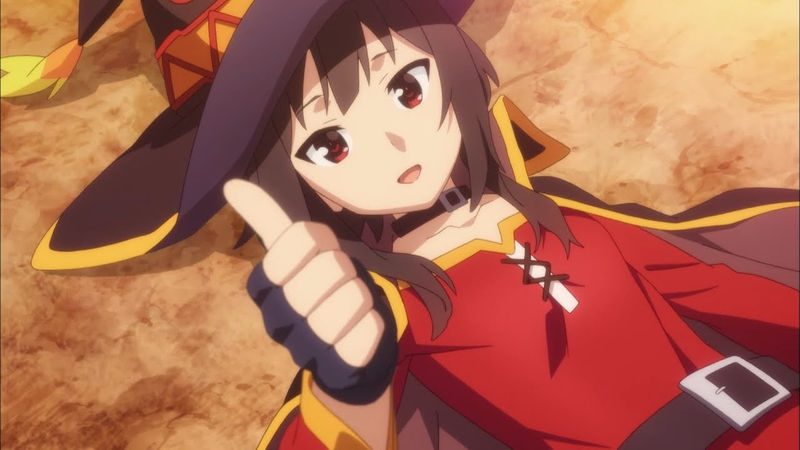 KonoSuba brought out a few of the biggest laughs of the year and who could say no to our favorite explosion expert. Rakugo gave us some of the most well written character drama anime has ever given, with depth and nuance to everyone but none moreso than main character Yurakutei Yakumo whose gradual rise to the top of the Rakugo world was nothing if not bumpy. Be sure to vote in our AniTAY Awards as well! Until then, this was our Top of 2016, what was the top anime for you, our dear readers?